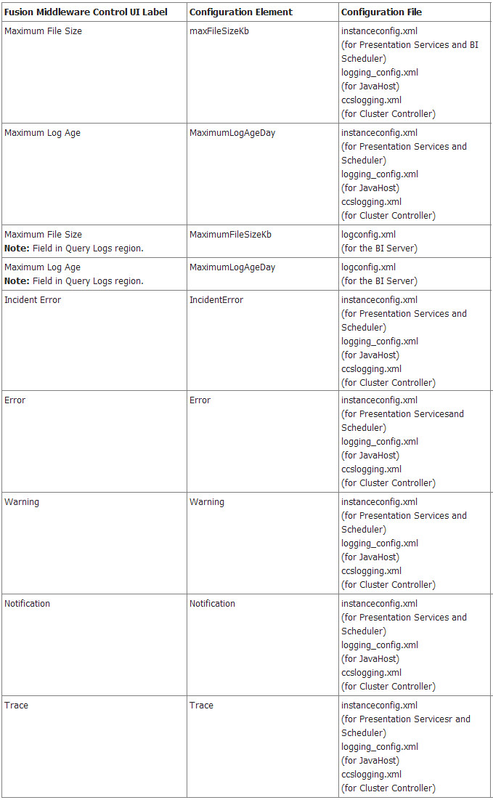 What are the Configuration Files that will be updated with the changes made in EM? The beauty of OBIEE 11G is that the major system administration tasks can be performed using Oracle Enterprise Manager for Fusion Middleware Control (EM) application. 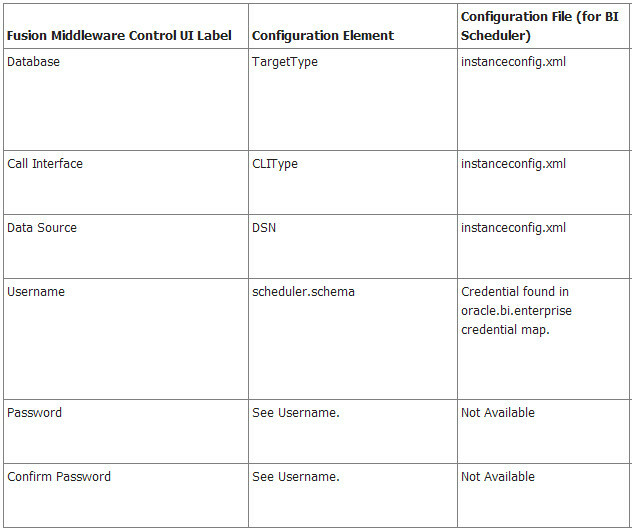 We can use Fusion Middleware Control (EM) to centrally manage, monitor, and configure Oracle Business Intelligence system components (for example, the Oracle BI Server, Oracle BI Presentation Services, and Oracle BI Scheduler) and some aspects of Java components. For example, you can monitor their status and start and stop them. Once you logged into EM, you can manage the OBIEE by navigating to Business Intelligence folder. The OBIEE management can be done through the following different tabs. These tabs consist of different set of configuration settings that we can change relevantly during our journey in application development and usage. 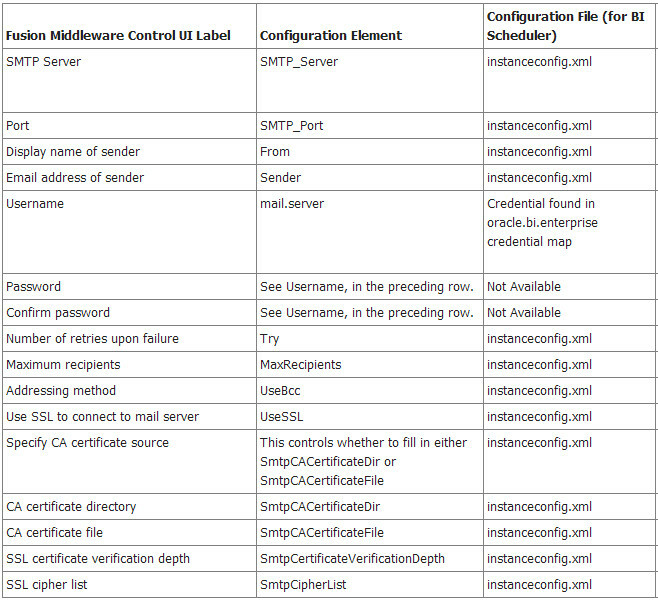 But as an administrator, for completeness, we should know that what configuration files will be updated with the FMW EM changes. 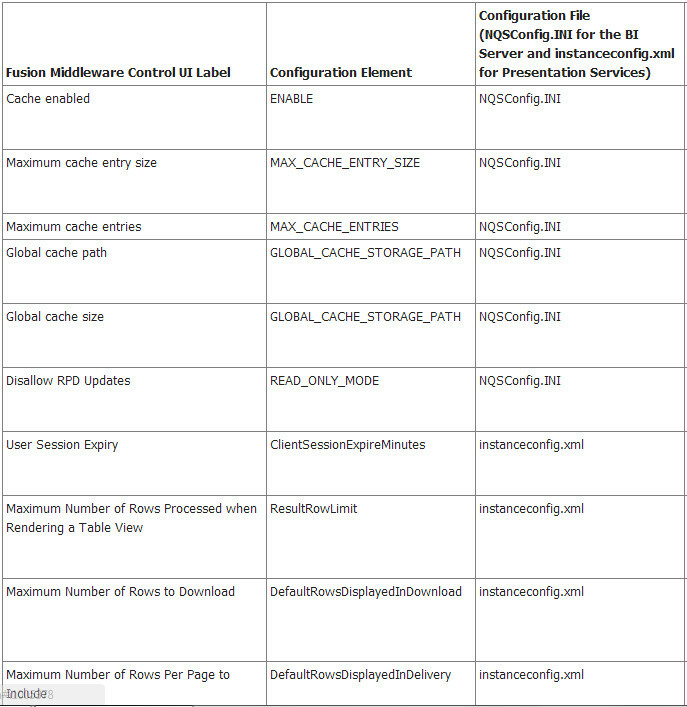 Here the following tables contain the mapping information of the Fusion Middleware Control (EM) labels for Oracle Business Intelligence with the corresponding element names used in configuration files. Hope this excerpt helps you. In OBIEE enterprise topology, make sure the external load balancer used should be able to terminate SSL requests at the load balancer and forward traffic to the back-end real servers using the equivalent non-SSL protocol (for example, HTTPS to HTTP). 1. Log in to the Administration Console. 2. Click the domain name in the navigation tree on the left. 3. Click the Web Applications tab. 4. In the Change Center, click Lock & Edit. 5. Select WebLogic Plugin Enabled. 6. Click Save, then click Activate Changes. 7. Restart the Administration Server and Managed Server. When WLProxySSL is set to ON, the location header returned to the client from WebLogic Server specifies the HTTPS protocol. 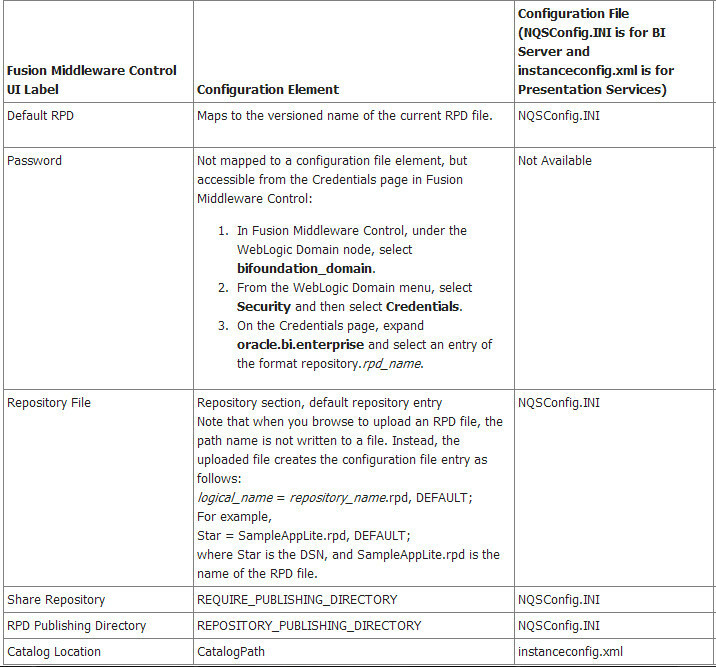 For those who are interested to know about Fusion Middleware products deployment on application servers other than Oracle weblogic server, here is great information on FMW support with IBM WebSphere Application Server (WAS). On a high level, An IBM WebSphere Application Server (IBM WebSphere AS) cell contains one Application Server. An IBM WebSphere Application Server Network Deployment (IBM WebSphere ND) cell contains one or more Application Servers that can be clustered for high availability and scaled to meet performance needs. A typical Oracle Fusion Middleware product environment consists of a cell with Oracle Fusion Middleware Application Servers (including one Administration Server) residing on multiple nodes. 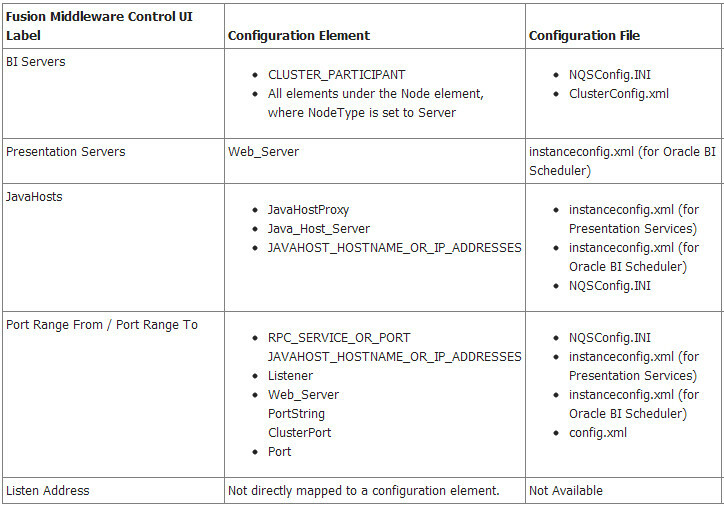 The Cluster Member 1 and Cluster Member 2 Application Servers are clustered, with on server one Node 1 and the other server on Node 2, allowing for high availability and scalability. Server 1 and Server 2 are not clustered. To scale the environment, you add additional nodes to the cell by federating a machine to the cell, and then add new servers on those nodes. The Configuration Wizard also provides the option to modify the basic configuration that is created by the product template. For example, you can add Application Servers and clusters, change JDBC data source settings, and change deployment targets.